The district town of Mělník is located on a natural elevation in the Polabská Lowland 30 km north of Prague. This ancient royal dowry town has 20,000 inhabitants and, as a centre of the agricultural region, is famous for its grapevine growing and annual vintage festival. We can watch the unforgettable confluence of the Elbe and Vltava rivers from the Mělník lookout, but also Říp Mountain and the Central Bohemian Uplands in good visibility. One of the most sought-after areas in Mělník is Kokořín region with sandstone rocks and 14th-century Gothic Kokořín Castle. Hořín Chateau is in close proximity. The town of Mělník was founded in the 13th century from the settlement around the castle and later from the market settlement. There is no foundation charter. Therefore, the first mention according to which Mělník was considered a town appeared in the document of Ottokar II of 25 November 1274 which donated a share in the yield of the Elbe trade to the people of Mělník to complete the village. 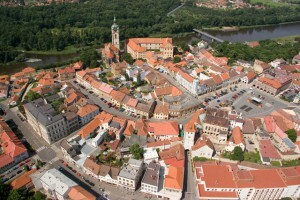 Mělník was permanently declared the royal dowry town by Charles IV. One of the most important sights of Mělník is the Town Hall, originally a seat of Vogt from 1398, a town hall since 1449, rebuilt after a fire in 1793 and again in 1889 and 1941, as well as the Gothic three-nave Church of St. Peter and Paul, originally Romanesque of the 11th century, the graveyard Church of St. Ludmila built in 1585, rebuilt in 1683, Capuchin Church of Fourteen Holy Helpers with a former monastery, and Renaissance and Baroque houses in the square and Palackého Street or Prague Gate (about 1500) and remains of walls with a bastion and a water tower are also worth seeing.